Tips on Making A Compost Heap. The Compost Bin A compost bin should be about 1 square metre. It is important to have a good size, but, it should also be compact because otherwise the generated heat will be dissipated. It is also best to have at least two bins. This enables one heap to rot down, whilst the other is added to. A compost heap should also be aerated and enable water to enter. If you have an enclosed plastic bin, make sure you water where necessary. Positioning. A compost heap can be really be put anywhere; most people want to choose a spot that is not too prominent. However, if it receives direct sunlight the process of decomposition will be faster. Base Layer. 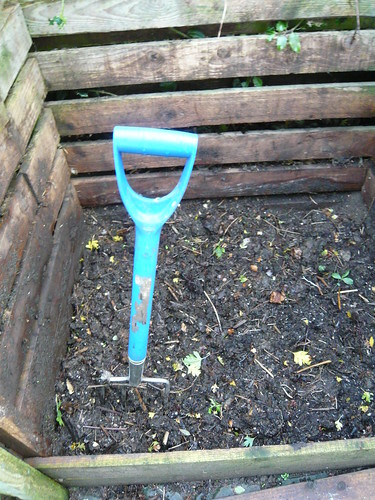 At the bottom of a compost heap it is good to use some twiggy material to make sure there is good drainage; if you have a heavy clay soil, you might want to add some grit to provide good drainage. If a compost heap becomes waterlogged, the process of decomposition will slow down and it will become slimy. Mixing Layers. The next important strategy is to provide a good mix of material when building up a compost heap. For example, grass is a high source of nitrogen and can break down quickly to generate heat. However, grass needs to be mixed with other more woody material, otherwise it will not rot down properly. Similarly on their own stems and twigs will take a long time to rot down unless they have an activator like grass or over very green material. When adding grass clippings spread them out to form a thin, equal layer; then add a layer of more twiggy material. If necessary store a potential layer for adding at the right time. Breaking Up Twiggy Material. Thick stems will take a long time to break down. If you have a shredder, it will make the job of composting a lot more successful. It will break down the material and enable much faster composting. If you don’t have a shredder, you can just squash the stems or break them in a few places. A rather crude, but effective, tip is to get a spade and hit down on the top of the heap to break a few stems. Even this small step will help quite a lot; what you are doing is to increase the surface area, enabling faster decomposition. Water. As mentioned before, water is important. It is important to water a compost heap a bit like watering a plant. If there is no water, the compost heap will dry out and will not decompose. If it is waterlogged it will stagnate. Most compost heaps suffer from being dry, so every now and then throw on some water to speed up the process of decomposition. Cover. When the compost heap is finished with adequate amounts of water, it is good to cover with a plastic coating. This enable the heap to generate more heat, speeding up the process of decomposition; it also prevents excess water. Aerate. In hot weather when a compost heap is generating a lot of heat it is a good idea to get a garden cane and poke the heap, every now and then. This allows air to enter and expedites the process of aerobic decomposition. A good heap will have steam coming from it when you aerate it. A well made compost heap has various benefits for both the environment and your own garden. Compost heaps are relatively easy to make and a well made heap gives a personal sense of satisfaction. Main benefits of a compost heap. Saves Taking Garden and Kitchen Refuse to Landfill. This will save you time, but also help the environment by reducing strain on landfill sites. You also save petrol and time of taking garden rubbish to local tip. Provides Excellent Organic Soil Improver. Garden composts is high in trace elements and so helps fertilizes the soil. It is also an excellent soil improver adding much valued humus to the soil. Well rotted garden compost will help any soil, but especially if you have a sandy or clay soil. Natural Cycle. Composting dead material to put back into the soil, is a natural process of Mother Earth. By composting material, we make our garden more of a living organic entity and can rely less on artificial fertilisers. Attractive soil conditioner. Some people feel a compost heap is to be kept well hidden, but a well made compost heap needn’t be a source of embarrassment, plus the rotted compost has an attractive and sweet smell to it. Provides a home for numerous insects, worms and creatures involved in the environmental cycle. 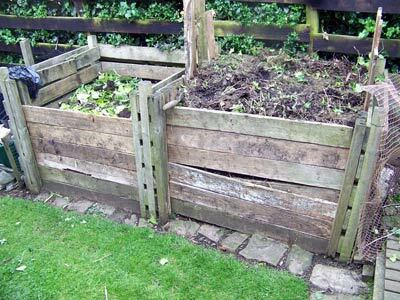 Greedy boards can be used in summer to increase the height of your compost heap. Leafy matter reduces in volume quickly and the extra space can be useful. Adding a sprinkling of garden soil will improve the rotting process by adding bacteria, worms and trace elements. I do this when there is a lot of green matter and not much brown to compost. Shred and chop your waste into smaller parts. The rot sets in to all the damaged and cut areas quicker than undamaged stems and stalks. A chipper or shredder may be used for branches and trees. Potential Problems of Compost Heaps. Rats and other vermin – attracted by cooked food. – Don’t put meat or cooked food on a compost heap, but do put vegetable peelings and other uncooked organic waste. Odour. A badly made compost heap made start to smell of methane. But, this tends to be compost heaps that become sodden and waterlogged. Solution – put a mix of green material with more woody stems. Provide aeration and cover in excessive rain. Doesn’t Rot Down. This occurs if the compost heap is badly made. – too wet or too dry, or not enough sources of nitrogen such as grass clippings. Disease. Don’t compost plants if they are infected with disease as these could be recycled, better to burn or dispose of diseased plants.